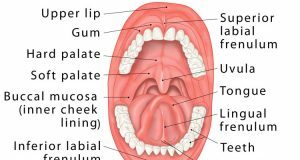 The human oral cavity refers to the mouth, and all its parts including the lips, tongue, teeth, and the roof and floor of the mouth [1, 2]. Primarily belonging to the digestive system, the oral cavity also plays an important role in respiration . The oral cavity is located just beneath the nasal cavity, the two being separated by the palate . Extending from the mouth opening, it continues till above the throat, to the beginning of the oropharynx, the part of the pharynx located just after the oral cavity . It starts from the opening of the lips (oral fissure), continuing to the back of tongue, to the point where the oropharynx begins (oropharyngeal isthmus) . The hard and soft palates constitute its roof, and the tongue constitutes the floor, with the cheeks bordering the oral cavity laterally. The first part of the oral cavity, the vestibule, opening with the oral fissure, is bounded by the lips and mucus lining of the cheeks in front, and the teeth, gum, and alveolar processes (the thick bony ridge containing the tooth sockets) in the back . It also includes the fleshy mobile part of the tongue. The fleshy and muscular upper and lower lips are connected with each other by the labial commissures (corners of the lips) , while fleshy folds of the mucus membrane (superior and inferior labial frenulum) connect the upper and lower lips with the gums – the reddish or pinkish mucus-covered connective tissues surrounding and supporting the teeth . The enamel covering of the teeth is the hardest structure in human body . 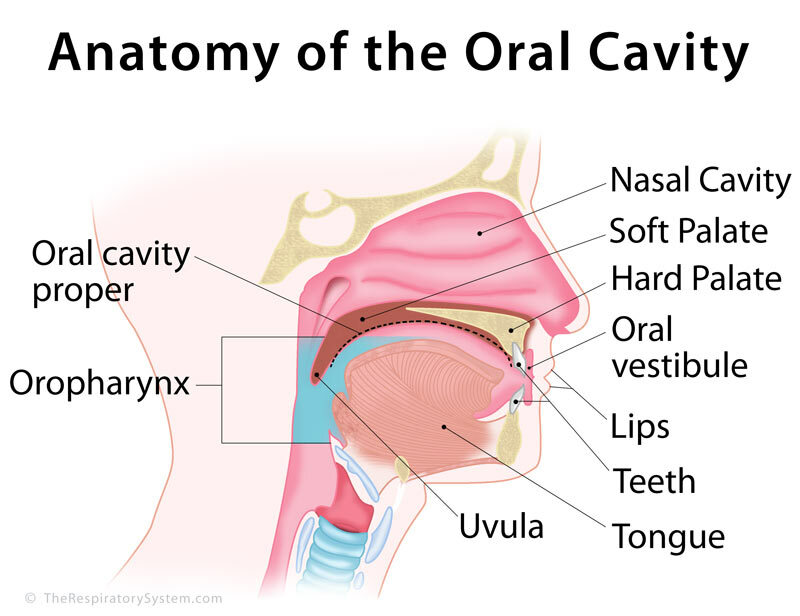 The posterior part of the oral cavity is referred to as the mouth proper. It is bordered by the hard palate in the upper front, while the soft palate constitutes the upper back boundary . Inferiorly, it has various oral muscles, glands, tongue attachment to the oral cavity floor  through the flexible band of tissues known as lingual frenulum . The oral cavity proper is also surrounded by mucus membrane continuing from the vestibular walls . A fleshy protrusion, uvula, is located at the back of the soft palate, moving along with it to keep food from entering the nasal cavity . There are three major paired salivary glands: the parotid, submandibular (submaxillary), and sublingual glands . The vestibule area receives the secretion from the parotid glands , while the submandibular and sublingual glands open into the oral cavity proper . Minor salivary gland pairs opening in the mouth include the labial, buccal, palatal and lingual glands, all of which assist in chewing . The oral cavity is innervated by the trigeminal nerve (CN V), which divides into multiple branches to supply to its different parts. The maxillary nerve, one of the three trigeminal nerve branches, innervates the hard palate through its two branches, the nasopalatine and greater palatine nerves. Another maxillary branch, the lesser palatine nerve supplies the soft palate . The lingual branch of the mandibular nerve (another trigeminal nerve branch) provides the sensory innervation to the oral cavity floor, while its buccal branch supplies the cheeks . Chorda tympani, a facial nerve branch, supply the tongue with special sensory fibers so it could detect different tastes. . The mandibular and maxillary bones constitute its basic bone structure [3, 12]. The lips are controlled by the orbicularis oris muscle, which also play a major role in controlling facial expressions . The buccinator muscle forms the cheeks, while the mandible, hyoid bone, pharynx and the styloid processes provide muscle attachment to the tongue, and the oral cavity floor . Though not a primary part of the human respiratory system, its functions include serving as the secondary passage for air to enter and exit the respiratory tract during inhalation and exhalation . So, when the nasal cavity cannot function properly, like in case of a blocked nose, the oral cavity serves as the pathway for air, and leads it into the airways through the pharynx. However, since the oral cavity is much shorter than the nasal cavity, and lacks the mucus lining and cilia present in the latter, it does not moisten and purify the inhaled air . It is where the first step of digestion – ingestion or food intake – takes place. 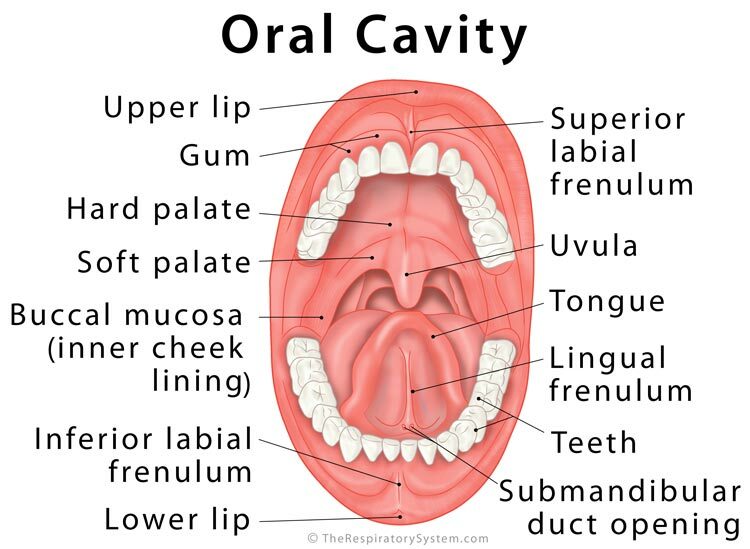 The oral cavity is the primary external opening leading into the gastrointestinal or digestive tract . As you eat, the teeth tears, breaks, and grinds the food (the process medically known as mastication), while the tongue contributes to prepare it into a soft mass to be digested by mixing it with saliva (secreted by the salivary glands) , completing the mechanical digestion of food. The taste buds located on the tongue also allows you to taste the food . The process of chemical digestion begins within the oral cavity as well, with the salivary glands also secreting certain enzymes to break down starch and carbohydrates [17, 18]. The mouth is instrumental in speech production, as the air exiting through the oral cavity from the voice box is manipulated here to form words . The lips, tongue, hard and soft palates, and even the teeth are vital in speaking, as well as any other sound production . Even a minor malformation or abnormality in the development or functioning of the oral cavity can seriously affect an individual’s daily life and activities, as it allows humans to eat, breath, speak, and express.